Springville, CA, April 4, 2012 – TEDCF Publishing, an Autodesk Authorized Publisher and member of the Autodesk Developer Network, today announced that seven of their video based training courses have been certified for Autodesk Inventor 2013. TEDCF Publishing’s training courses are designed to teach beginner and advanced users the most effective ways to use Inventor. Each course uses a progressive teaching style intended to builds sound skills that increase productivity. 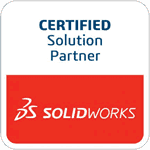 Certification demonstrates that they have met Autodesk’s highest quality and customer satisfaction standards. Assemblies and Advanced Concepts takes the skills developed in the Solid Modeling course to a new level. It deals with advanced concepts like iParts, iFeatures, and iAssemblies. Users learn best practices for applying assembly constraints, working with flexible and mirrored assemblies, creating adaptive parts and assemblies, working with the Design Accelerator, and several advanced part and assembly development methods like top down, middle out, and bottom up design. 2D Drafting and Customization is the third course in the series. It covers all the commands associated with 2D drawings in detail, as well as best practices for using the commands. It also shows users how to create custom drawing templates and styles, and how to interface with AutoCAD. Sheet Metal Design shows users how to work with sheet metal parts as well as tips and tricks that can be applied to standard parts and assemblies. It covers all the sheet metal commands, explains how to fold and unfold parts, and it demonstrates critical techniques needed for punches, K-Factors and Bend Tables. It also covers the Frame Generator, the Weldment environment, and more advanced concepts. Tube and Pipe Routed Systems is an advanced course designed to streamline the process of creating routes and runs using the Inventor Tube and Pipe module. TEDCF Publishing recommends that users watch the Solid Modeling, Assemblies and Advanced Concepts, 2D Drafting and Customization, and Sheet Metal Design courses before attempting to master the concepts in this course. It shows in detail how to make custom Tube and Pipe Styles, publish custom iPart Families to the Content Center, create derived routes and autoroutes, and the tasks required to populate routes. Most importantly, this course shows users how to work effectively in the Tube and Pipe environment to assure that runs update properly and automatically when assembly components are modified. The course for Inventor Studio is an advanced tutorial designed to show users best practices for rendering images and animations. TEDCF Publishing recommends that users watch the Solid Modeling, Assemblies and Advanced Concepts, 2D Drafting and Customization, and Sheet Metal Design courses before attempting to learn the concepts in this course. It breaks the processes of creating professional looking images and animations into manageable and easy to understand steps. iLogic is a fast way to automate the construction of models, assemblies, and drawings and the learning curve is shorter than one would think. Users need to have the strong foundation of the advanced skills taught in the first 6 courses, but iLogic can be mastered even if you don’t have programming experience. iLogic Made Simple starts with the basics and progressively builds the skills required to automatically change features on parts, change parts in assemblies and generate drawings for all the new parts. It simplifies the process to assure that all the necessary steps are employed when using iLogic. The training courses offered by TEDCF Publishing run from a single installation on a PC computer. Users can pick specific courses to watch or watch course bundles containing several courses. Visit Autodesk Inventor 2013 Training to learn more about TEDCF Publishing’s Autodesk Inventor 2013 Certified courses. David Melvin, PE is a licensed Mechanical Engineer and Autodesk University instructor with over 25 years of experience in research and development for major companies. He founded The Engineering Department Consulting Firm in 1998 and soon discovered that he needed an easier and faster way to train his draftsmen and engineers to use Autodesk Inventor software. This need led to TEDCF Publishing’s video-based training courses in 2000. Now these courses are used by thousands of professionals, students, and teachers all over the world. Founded in 2000, TEDCF Publishing is a division of The Engineering Department Consulting Firm. The company attained recognition as an Autodesk Authorized Publisher & Developer within the first year of business. The company provides training courses on CD for Autodesk Inventor 6 through 2010, SolidWorks 2009-2011, and Microsoft Excel. Courses for Autodesk Inventor 2011-2013 are available via download or on DVD.